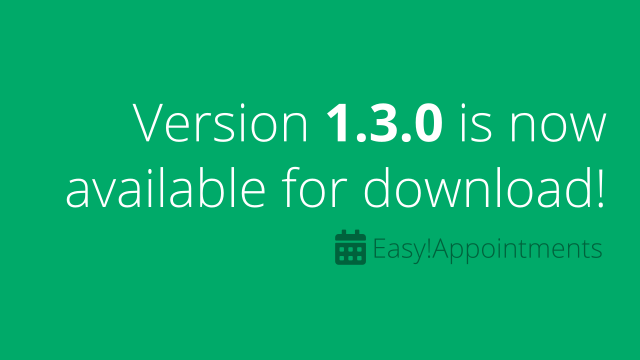 We are more than happy to announce that Easy!Appointments version 1.3.0 has finally made it to a stable release and brings many new features and improvements to the platform. Here are some of the most notable changes of this release. Multiple attendants and flexible time intervals introduce further complexity into any booking system. Easy!Appointments can now handle more complex use cases when it comes to multiple attendants for the same time slots. Take advantage of the flexible scheduling engine! Appointment notifications will now contain an ICS file attachment that can be used with to import the event information into external calendars. Many office suites will parse these files automatically and propose event actions right in place. Thanks to Rashed Altamimi and Abdulhamid Ghannam Easy!Appointments is now translated into Arabic (although RTL support will come with a future release). Keep contributing to the project with more translations and localization details and help Easy!Appointments become more flexible and easy to use. Easy!Appointments will now use FullCalendar 3 packages for the calendar page which provide better user experience, better event handling and more stable execution. Moreover, new settings became available with the update and future releases will strive on taking full advantage of them. Docker has become one of the most popular development tools and that for a good reason. Easy!Appointments has now an official Docker configuration that can be either used for development or production environments. Docker will help you setup Easy!Appointments without ever needing to install Apache/Ningx, PHP or MySQL manually. A more detailed tutorial will become available soon. As with every new release the codebase received a big variety of improvements which aim to make new feature development, debugging and customizing easier so that developers become more productive when working with Easy!Appointments. Thanks to your wonderful support many reported issues were addressed and made it to the final release, something that makes the platform more stable and secure. The update procedure has now a simple UI that will inform the user of the update outcome and provide more technical details for easier debugging. Once the debug mode is on the app will provider more technical information for better troubleshooting and support. Cache busting mechanism will ensure that older clients will receive the new asset files when browsing Easy!Appointments. Thank you for all your support and for being active members of the Easy!Appointments community. Stay tuned for more updates, features and improvements.